Rolex creates the ultimate nautical timepiece with the Yacht master collection that is perfect for your sea-faring journey. It comes with a 40mm 18K Yellow Gold Case that has a screw-down case back and winding crown. It has a scratch resistant sapphire with a cyclop lens over the date. 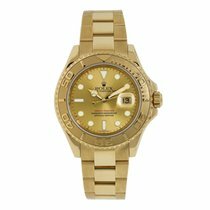 The 18-carat yellow gold bezel with raised numerals and id rotatable in both directions. It runs on the 3135 Caliber with a -2/+2 sec/day, which is a perpetual, self-winding movement that has date and stop send functionality and a power reserve of 48 hours. It comes with a yellow gold oyster bracelet that has a folding oyster clasp. It has a white dial with yellow gold hour markers with highly legible chromalight display. It has a water resistance of 100 meters (330 feet). The watch comes with Rolex box and Avi & Co Appraisal.